Every family has their traditions. Growing up, every family gathering I attended had Pickle Salad. It is a creamy white salad made of cucumbers, with a fresh salty-sweet-pepper bite. It’s delicious and I always looked forward to it. 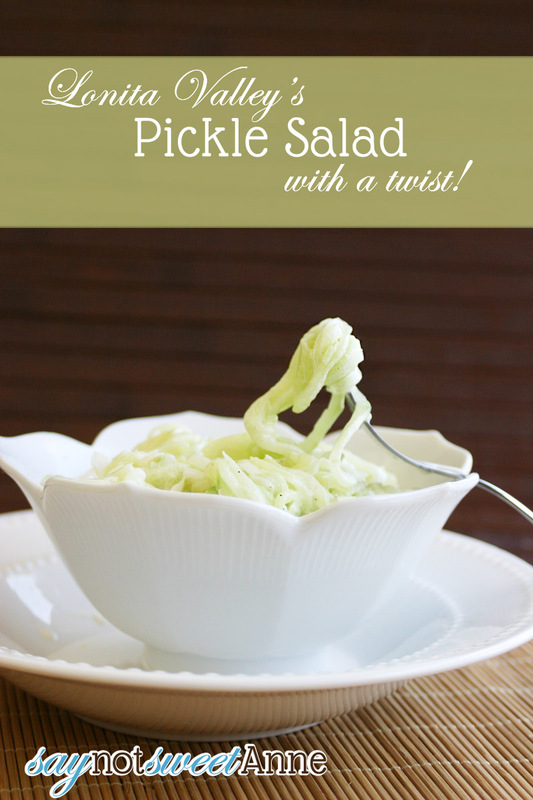 Until I started attending my husband’s family functions, I thought everyone made Pickle Salad. Turns out that this type of Pickle Salad isn’t a very common dish. Even searching the web for “pickle salad” or “cucumber salad”, most of the results are vinegar based. So, I asked my family where it came from. Near as anyone can tell, My Great Grandmother Loneta Valley brought it into the fold. No one knows where she got it from. The one thing I don’t love about this dish is that it is hard to eat. 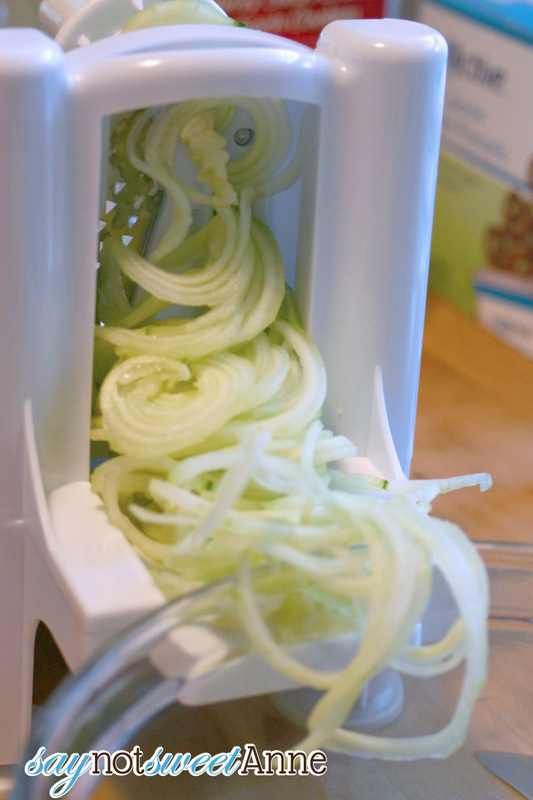 Wet cucumber slices get floppy and slippery. You can’t pierce them with a fork, you can’t scoop them except one at a time. So, when I got my new Spiral Cutter from Amazon this week, I decided to twist up Loneta Valley’s recipe. (pun intended). See, the spiral cutter has been my obsession since I saw a delicious post from my friend Bethany at Sprinkles and Allergies. So, I found one on Amazon and I ordered it. It arrived yesterday and I got right to it! 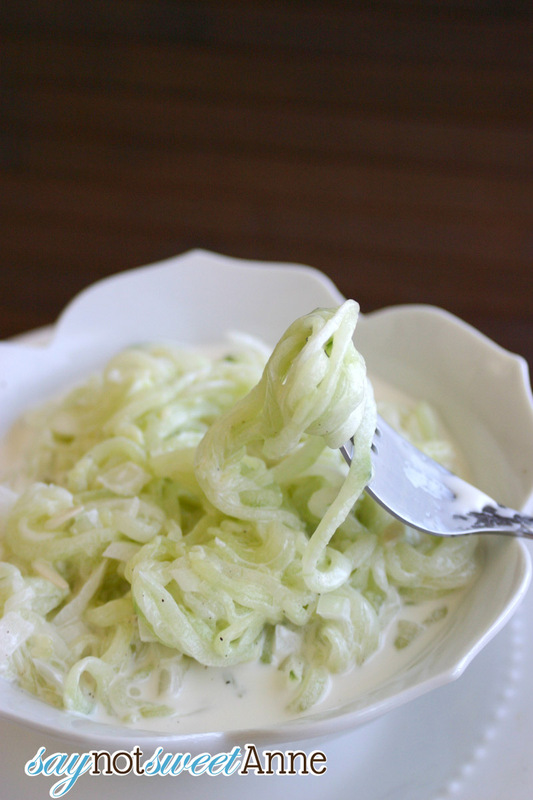 I cannot believe how much like cold noodles these cucumber “noodles” feel! They are so fun to twirl around my fork and they are WAY EASIER to eat than the slices. I made this batch to take with me when I go camping this weekend. We’ll see what my grandma thinks of my twist on her mom’s recipe! Don’t have a spiral cutter? That’s okay! Don’t let that stop you from trying this salad. Just serve it with spoons to make it easier to eat!! Cut up your cucumber. The spiral cutter was super fun, but slices will work too! Sprinkle 1/4 tsp salt over the cucumber and toss. Let sit in the fridge for about an hour. Let flavors meld at least a n hour in the fridge. It’s always better the second day! Kayla, I like the new twist on grandmas pickle recipe. It looks like its alot easier to eat. She would have loved it!!!! Yummy! I love all kinds of Salad. I’ll definitely try this. This looks great. I just bought a spiralizer and am looking for recipes. This may make it into my New Year’s Day menu. thx. So glad I found this recipe. I grew up with one like this, but when I called my mom and siblings they didn’t remember it. Thanks for posting! I hope that you love it! It reminds me of my grandma (and great-grandma by extension) every time!